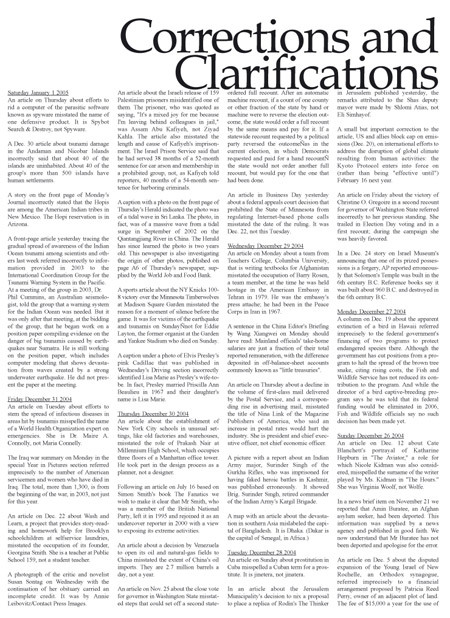 Corrections and Clarifications is an ongoing newsprint project, an edited compilation of daily newspaper corrections from September 2001 to 2015. It is an intermittent interrogation into the detection, acknowledgment, and retraction of errors organized into a reverse chronology, that is, correcting each day what has been printed the day before. 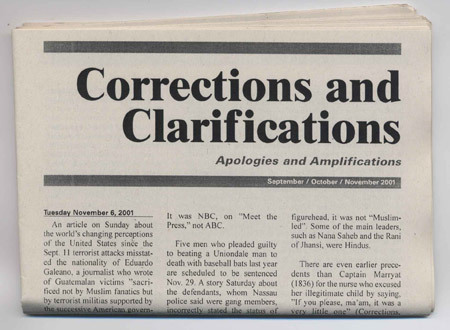 A catalog of lapses in naming and tangling of catch-phrases, Corrections and Clarifications suggests a more than incidental relation between news mis-speak and consolidated media interests. 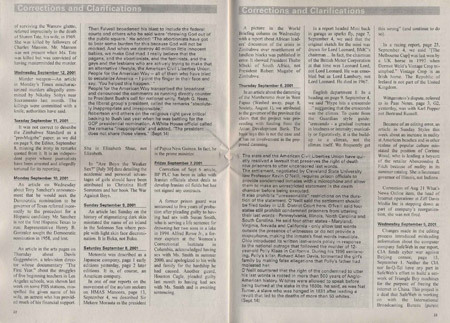 Previous editions have examined the printed news media in the US, UK (as well as other international press in Australia and Asia printed in English), Germany, Austria, Switzerland, and more recently, that of Bosnia, Serbia, Croatia, and Slovenia. Purely editorial credit to those who have provided the material for this publication by having seen fit to correct themselves, or having seen themselves fit to correct others; who have sought in some public way to offer apologies or clarifications – to redeem, reveal, revise, retract, or shift, to simultaneously claim, deny, and re-attribute blame and responsibility. 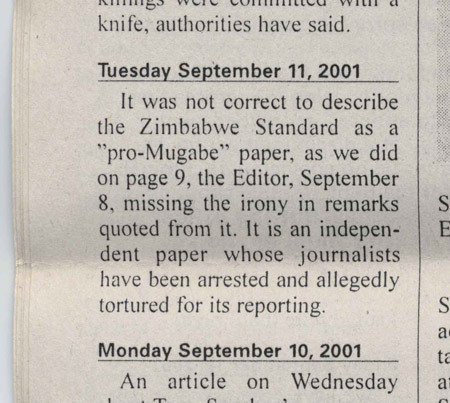 Credit is due for these well-documented efforts to apologize for what is being done and for what has already been done, for continuing attempts to un-say what is said, un-mean what is meant. Credit at a variety of levels to those seekers, processors, middle managers, and ultimate regulators of public information who take it upon themselves (or impose it upon others) to re-name, re-classify, disguise, de-fuse or be de-briefed; who find clever metaphors to obfuscate, euphemize and mystify; who disseminate information according to political structures coincident with particular economic interests, who consent to use language to dismiss, excuse, cushion, cover and obscure the consequences of actions and the submerged structures behind events. And ultimately who, regardless of stated intentions, occasionally reveal something, piece by piece, through slips in language and naming systems. Perhaps what is conveyed unintentionally, and by repetitious mistakes, is significantly more revealing, more historically identifiable, and substantially less conciliatory than it is meant to be. This is both fortunate and inevitable. With further acknowledgement, appreciation, and gratitude to readers who regard these revisions and retractions with the same skepticism they have the originals.